M.C. K~Swift (New Rap Order/ Universal Zulu Nation) is the Director of Youth Services for the Universal Zulu Nation. He is a Hip-Hop artist and educator, who has been recording and performing since 1994. He’s been a published poet since the age of 17, and appears in HBO’s “Brave New Voices” series. M.C. K~Swift has conducted creative writing and performance workshops in hundreds of high schools in NYC and throughout the tri-state area since 1999, as well as in institutions including: CUNY Grad Center, The New School, NYU, Wesleyan University and Columbia University. He has also trained educators at numerous schools, non-profit organizations and community centers on cultivating creativity in their classrooms. A founding member of the progressive Hip-Hop collective, New Rap Order, and a member of the Universal Zulu Nation, M.C. K~Swift is among both the vanguard and the old guard of True School Hip-Hop Culture. This entry was posted in Culture, Education, Freedom of Expression, GrassRoots Movements, Higher Education, Hip-Hop Culture, Hip-Hop Education, History, Knowledge, Music, Poetry, Sociology, Student Organizations, The Bronx, Understanding, Universal Zulu Nation, Wisdom and tagged Culture, Education, Hip hop music, Hip-Hop, Hip-Hop Culture, Hip-Hop Education, Hip-Hop History, Keynote Speaker, Knowledge, Music, New York City, Sociology, the Bronx, Universal Zulu Nation. Poet, Educator, Author, Actress, Lyricist, Songwriter, Producer, and Hip-Hop/Musical Ambassador to the U.N…. 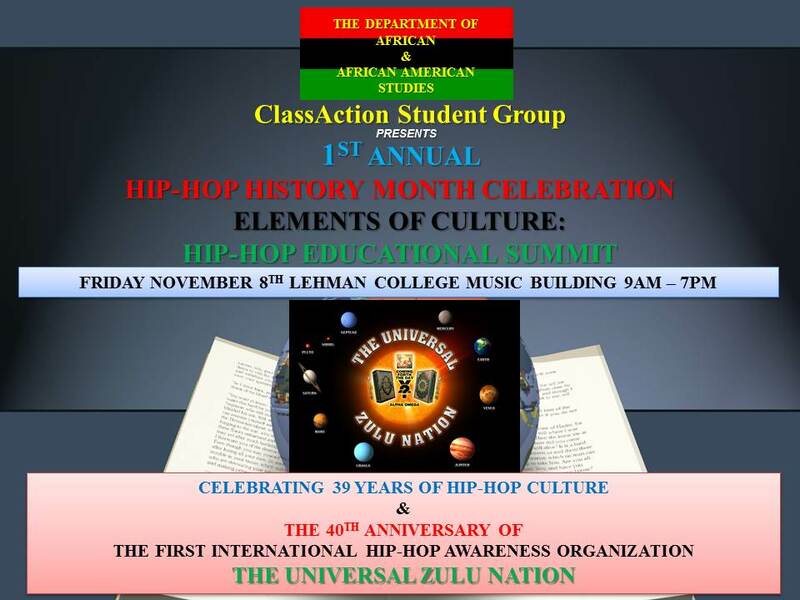 Toni Blackman is this year’s Keynote Speaker for the 1st Annual Hip-Hop History Month Celebration: Elements of Culture Hip-Hop Educational Summit. Toni Blackman is a cultural ambassador and an advocate of improvisation. Her experiences as a diplomatic worker enable her to move through various communities (the arts, political circles, international gatherings, youth groups, academia, and the music industry) with ease. As America’s first Hip-Hop Ambassador, her work has consistently communicated that hip-hop is the international platform to position the US as a good global citizen. Blackman has traveled and worked in 30 different countries including Senegal, Ghana, Botswana, Swaziland, Ivory Coast, the DRC, Brazil, South Africa, Angola, and a host of places in Europe. Her diplomatic work encompasses peace and reconciliation, literacy, HIV awareness, and gender violence prevention. 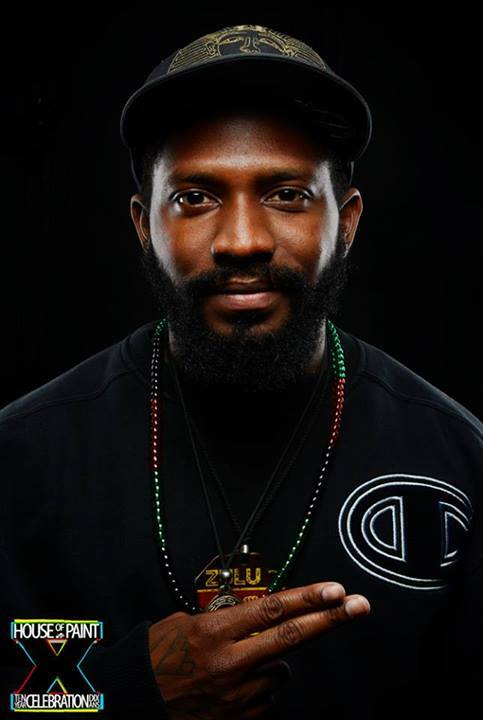 Highly respected as the founder and director of Freestyle Union, a cipher workshop that uses free styling as a tool to encourage social responsibility, Blackman’s work has held great influence in the world of hip-hop activism. This former Echoing Green Fellow has also been a fellow with the Soros Foundation’s Open Society Institute. A great deal of Blackman’s creative organizing efforts involved the Freestyle Union and its woman-centric initiative Rhyme Like a Girl, which launched in partnership with Girls, Inc., and later partnered with the New School University. Toni Blackman has transformed her passion for creativity and improvisation into a powerful presentation on “getting open,” being centered, and harnessing one’s own personal power from the inside out. She has performed and spoken at the Aspen Institute Summit in Oman, at the prestigious Pio Manzu International Conference in Italy, during the World Cup at the ManUp Summit in South Africa, and for the FORD Foundation and City Xpo Big Ideas Conference in Virginia. She has led workshops and trainings for the NBA, Craigslist Foundation events, Julliard, Ross School of Business-UM, Smithsonian Museum, Harvard, Girl Scouts “Beyond Bars” program for incarcerated mothers, Latin American Youth Center’s Gang Violence Prevention, MDGFive UN program for Maternal Health, and Institute for Policy Studies. A former adjunct professor of hip-hop at Binghamton University and a visiting professor at University of Michigan, Blackman is currently a judge for the US Department of State’s American Music Abroad program. She toured Southeast Asia with Jazz at Lincoln Center’s Musical Ambassador Program and has shared the stage with the likes of Erykah Badu, Mos Def, The Roots, Wyclef, Dougie Fresh, Wu Tang Clan, GURU, KRS One, Bahamadia, Dead Prez, Boot Camp Clic, Me’Shell NdegeoCello, Sarah McLachlan, Sheryl Crow, Jill Sobule, James “Blood” Ulmer, Vernon Reid, Youssou Ndour, and even Rickie Lee Jones. Her first book, Inner-Course, was released in 2003 (Villard/Random House). Toni Blackman is available for performance workshops, lectures, inspirational talks, and small group and private coaching. This entry was posted in Culture, Education, Freedom of Expression, GrassRoots Movements, Higher Education, Hip-Hop Culture, Hip-Hop Education, History, Knowledge, Music, Poetry, Sociology, Student Organizations, The Bronx, Understanding, Wisdom and tagged Culture, Education, Hip-Hop, Hip-Hop Culture, Hip-Hop Education, Hip-Hop History, Keynote Speaker, Knowledge, Music, Sociology, the Bronx. This entry was posted in Culture, Education, Freedom of Expression, GrassRoots Movements, Higher Education, Hip-Hop Culture, Hip-Hop Education, History, Knowledge, Music, Poetry, Sociology, Student Organizations, The Bronx, Understanding, Wisdom and tagged Culture, Education, Hip-Hop, Hip-Hop Culture, Hip-Hop Education, Hip-Hop History, Knowledge, Music, Sociology, the Bronx.